Gumbuya World is open from 10am to 5pm every day of the school holidays. The sun is back and it’s time to play! Gumbuya World is Victoria’s only water park open for the entire school holidays. And with the water heated to a perfect 26 degrees, every day promises awesome aquatic fun. 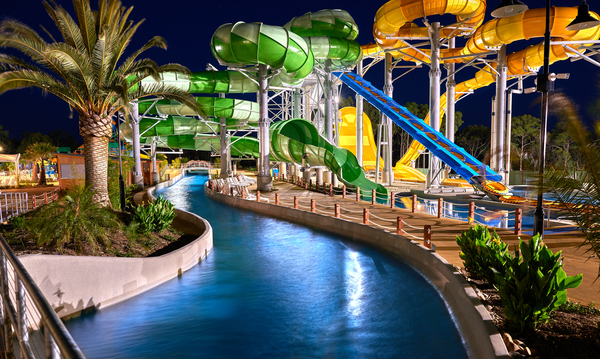 Take the plunge on epic water slides, get deliriously drenched on the aquatic jungle gym Typhoon Island, or soak up the rays on a relaxing drift along the 180-metre Lazy River. And there’s a whole host of new baby animals waiting to meet too! Cuddle up to adorable piglets, lambs and chicks in the Petting Zoo, then check out the amazing crocodile hatchlings in action in the Critter Cave. Or for the ultimate Aussie animal encounter, book an exclusive Wildlife Experience to get one-on-one and pat a python, cuddle a dingo, and take that perfect pic with one of the cute koalas. Thrill-seekers can also spin out on unlimited rides under the spectacular gum trees at Oz Adventure and Outback Explorers. Whether it’s flying sky-high on the Giant Tree Swing, enjoying the bumper car chaos of the Desert Derby or delighting in Berry Twirl, a super-sweet spin on everyone’s favourite Teacups ride, there’s fun to suit every speed. All this spectacular spring entertainment is ready to enjoy in one great value ticket – plus there are showbags as well! Annual Passes are also available. For more information and to book spring school holiday tickets, visit gumbuya.com.au.